ProX XS-MCX8000WLTBL Hard Flight Case For Denon MCX8000 with Gliding Laptop Shelf and Wheels. Condition: BRAND NEW IN ORIGINAL PACKAGING. The ProX XS-MCX8000WLTBL flight case is designed to fit the Denon MCX8000 controller and is crafted using the highest quality materials and workmanship, to give you the ultimate security for your equipment. If you have a passion for your gear and want to keep it safe, this case will ensure your investment is protected at all times. The XS-MCX8000WLTBL with included sliding laptop shelf is constructed with our rugged signature 3/8 Certified Gig-Ready Series Plywood, durable rubber wheels, reinforced steel ball corners, as well as recessed steel padded handles and latches. Additionally, there is 4 of space behind the controller to safely store your cables and small accessories. Below the controller, there is an additional space measuring 19" width x 2.75" height for convenience. The front removable panel allows easy and immediate access to the front controls and headphone inputs. The laptop shelf is also removable and can be removed when slid out to its furthest point. This item is part of our Black On Black series, which features an all-black exterior for a sleek, professional look. This ProX Digital Media controller case is manufactured with the Honey Comb laminated surface Design. Made with the super-sleek look of Honey Comb hexagon grids on all shell surfaces, which gives the cases an almost alien look! Note: For the safety of your equipment, please do not attempt to transport with any gear stored on the sliding shelf. 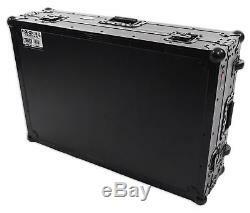 ProX XS-MCX8000WLTBL Hard Flight Case For Denon MCX8000+Glide Laptop Shelf+Wheels. Black on Black Digital Honey Comb exterior design. High-density foam interior support & casing. Recessed spring action Handles per Side. Heavy and powerful steel ball corners. 2x Low Profile Penn-Elcom Durable Tough Rubber Wheels. 4 cables and small accessories in the back. Below the Controller Space: 19" W x 2.75" H. Sliding Laptop Shelf: 31" x 12". Controller compartment: 28.5 x 16. Signature Series Certified Laminated Gig ready 3/8 plywood. Industrial Recessed butterfly twist lock latches that can be padlocked. Cable access hole with removable emblem cover. 16.00"Length (L) X 28.50"Width (W) X 3.50Height (H). 33.00"Length (L) X 22.00"Width (W) X 9.00Height (H). Best prices - We sell all ProX Products at the lowest price as possible. Detailed information of all products. Lifetime Customer Service by ProX Product Experts. Guaranteed legitimate and authentic merchandise. If your item is defective or you want to return it for any reason within the first 30 days of when it was delivered to you; you have the following options. We will send you a. To replace the item for a brand new one. All replacements and exchanges are free. This includes blown speakers with burned voice coils. The item "ProX XS-MCX8000WLTBL Hard Flight Case 4 Denon MCX8000+Glide Laptop Shelf+Wheels" is in sale since Tuesday, April 24, 2018. This item is in the category "Musical Instruments & Gear\Pro Audio Equipment\Cases, Racks & Bags". The seller is "audiosavings" and is located in Inwood, New York. This item can be shipped to United States, Canada, United Kingdom, Denmark, Romania, Slovakia, Bulgaria, Czech republic, Finland, Hungary, Latvia, Lithuania, Malta, Estonia, Australia, Greece, Portugal, Cyprus, Slovenia, Japan, China, Sweden, South Korea, Indonesia, Taiwan, South africa, Thailand, Belgium, France, Hong Kong, Ireland, Netherlands, Poland, Spain, Italy, Germany, Austria, Israel, Mexico, New Zealand, Philippines, Singapore, Switzerland, Norway, Saudi arabia, Ukraine, United arab emirates, Qatar, Kuwait, Bahrain, Croatia, Malaysia, Brazil, Chile, Colombia, Costa rica, Panama, Trinidad and tobago, Guatemala, Honduras, Jamaica, Bahamas, Viet nam.